We so enjoyed our stay in this cottage which is walking distance from from downtown, the river, and Mill District. We also enjoyed the beach cruiser bikes along the river trail with our sideways helmets. We cooked our favorite meal in the delightful kitchen. Lovely front porch and back deck. Dont pass this up! The Jefferson Cottage is amazing! My girlfriend and I stayed for a weekend. Excellent location! Walking distance to anything you could ever want. Quiet neighborhood. Tons of room for 2 people. The host provided a list of things to do, places to eat and drink, and contact information just in case we needed anything at the last second. Highly recommend! Such a wonderful place. 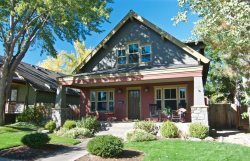 This little house is just perfect for a couples stay in Bend. We loved the reading area in the living room, and the bed was really comfortable. The kitchen has everything that you need to make a memorable meal, and is spacious for a house that size. 2 blocks away is a FANTASTIC restaurant that serves breakfast-dinner and everything in between, and youre only about a 6 minute walk from everything that downtown has to offer, including Mirror Pond. The restaurants and pubs downtown shouldnt be missed, and there are enough great shops there to keep you busy for the better part of a day. The house comes with two cruiser bikes, but it was still a little chilly for bikes when we visited. We will make use of those next time we stay there! All in all, it was a perfect place to call home for our trip to Bend. Short stay, but absolutely perfect. Cozy, clean, very nice upscale remodel, great location. 5 minute walk to downtown, manager Rebecca very helpful and accessible. Would highly recommend for anyone visiting the area. Also 2 cruiser bikes with helmets and locks available for use. My husband and I adored Jefferson Cottage when we stayed for a weekend ....we sure wish we could have stayed longer! Will definitely want to stay here again on our next trip to Bend. The house smelled sooooooooooo good upon coming in.....loved all the Mrs. Meyers hand soaps and other more natural products the home stocked. The house is decorated with such taste. We didnt need to use any of the appliances, plates and such, but boy are they stocked with beautiful wares! Comfy bed, soft towels, I do not believe the little cottage was lacking anything! The back deck was gorgeous and there were 2 bikes in the back laundry room. We didnt get to use the bikes or deck but definitely would have if we had more time. Just a short 2 block walk from the delicious Jacksons corner! Very close to downtown too! I truly loved this place and felt at home staying here. We sure hope we can return for a longer visit! Our three nights in this wonderful little cottage could not have been nicer. It is well equipped with anything you might need to enhance your stay. The location is perfect. It is accessible to the downtown area, and a block from a great restaurant, "Jackson"s Corner". The weather was very cold while we were in Bend, but the wonderful fireplace kept everything warm and very comfortable. My wife and I stayed here for three nights during a 2 week trip traveling Oregon. First of all the location is excellent, you wont need a car. If you have a car, park it in the driveway as its a short, easy walk to downtown, the river, and the old mill district. We found the cottage very well stocked with everything from a washer/dryer to a coffee grinder/french press, the latter was much appreciated! The cottage also comes with two cruiser bikes (and helmets) which we put to use during our stay. It was 104 degrees when we arrived and thankfully the cottage had a wall AC unit which kept the house nice and cool. The cottage also had a Bose sound system with a plug-in cord for a smartphone! We will definitely stay here again next time were in Bend! My partner and I stayed here for five days in the summer. It is a lovely size for two people, in a lovely part of town and within walking distance of downtown, where the Bend Festival was going on while we were there. The bed is extra comfortable and the linens are high quality. We especially loved the washer and dryer, which allowed us to hit the trails in clean clothes a couple of times. I completely recommend this cottage, and when we return to Bend we will try to book it again. Beautiful bungalow located near downtown, The Old Mill and on a quiet street. We loved the locatio and the house well well-equipped with everything you might need. The bed was super comfortable as was the bedding - we slept really well. We loved being able to pop out for a coffee down the street or craft beer tasting without worrying about driving (you dont need a car, necessarily.) It was very hot when we were in town but the home stayed cool. One thing we loved about Bend is we only turned the tv on once - there is just so much to do! We would stay here again most definitely. Weve stayed in other vacation rentals in the Bend area. This one is well-appointed and in a great location -- walking distance to downtown, the river and Old Mill area. Its a bit tight for more than two folks, but the fold out bed is pretty comfy. Good value for the price too. Great little house with all of the necessary components. Kitchen and outside grill, bikes, walkable to downtown, and quiet location. We will return.